Notizbl. Bot. Gart. Berlin-Dahlem 11: 611. 1932. TYPE: Costa Rica. Alajuela: at San Ramon, 1,200 m elev., Tonduz 17703 (B, holotype; CR, isotype). Anthurium isonervium Standl. & L. 0. Wms., Ceiba 3: 104. 1952. typi:: Nicaragua. Río San Juan: San Juan del Norte (Greytown), sea level, Charles Smith 61 (EAP. holotype; MO, US, isotypes). Epiphyte; stems short; roots pale green, in dense mass, ascending; cataphylls 8-11 cm long, coriaceous, drying brown, weathering into fibers and persisting at base of leaves. geniculum 1.5-2 cm long; blades elliptic to broadly elliptic to obovate or oblanceolate, moderately thick, 22-54 cm long, 9.5-24 cm wide, abruptly acuminate at apex, acute to obtuse at base; semiglossy above and below, conspicuously punctate below; the midrib raised and ± flattened (sometimes shallowly sulcate near base) above, convexly to acutely raised below; primary lateral veins 15-18 per side, departing midrib at 45° angle, sunken above, raised below, straight to collective vein, loop-connecting with collective vein; lesser veins obscure; collective vein arising from base, 3-6 mm from the margin. spathe coriaceous, yellow-green sometimes suffused with purple, lanceolate or oblong, 6-12 cm long, 1.5-2.8 cm wide. shon-acuminate at apex, obtuse to rounded at base, inserted at 40°-45° angle on peduncle; spadix green, tinged red-violet in later stages, 13-36 cm long, 5-11 cm diam. at base, 4-7 cm diam. at apex; flowers rhombic, 4-5 mm long, 3-3.5 mm wide, the sides straight to weakly sigmoid; 4÷8 flowers visible in the principal spiral, 6-10 flowers visible per alternate spiral; tepals matte, minutely papillate, lateral tepals 2.5-3.5 mm wide, the inner margin ± straight; pistil emergent but not raised, pale red-violet; stigma greenish, linear, not conspicuously open; stamens emerging rapidly throughout, anthers barely visible at edge of pistil, soon retracting leaving only sparse amount of white pollen. INFRUCTESCENCE with spadix to 48 cm long, berries pale red, to faintly lavender or grayish-white, flattened at apex (depressed around style), 4-5 mm long, 5-7 mm wide (direction of axis), 4.5-5 mm wide (perpendicular to axis); seeds 3-4, greenish-while, 1.6-3 mm long, 1.3-2.1 mm wide, 1.2-1.5 mm thick; mesocarp juicy, gelatinous, translucent. Figs. 151 and 154. The species is known from Nicaragua to Panama from sea level to 1,400 m elevation in wetter parts of tropical moist forest and in premontane wet, tropical wet, premontane rain, and lower montane wet forest life /ones. In Costa Rica, the species is widespread on the Atlantic slope and rare on the Pacific slope. In Panama, the species is most abundant on the Atlantic slope but occurs also on the Pacific slope near the Continental Divide. Anthurium ramonense is most closely related to A. paludosum, A. durandii, A. alatipedunculatum and A. acutangulum, which all share similar retracting stamens and densely punctate lower blade surfaces. 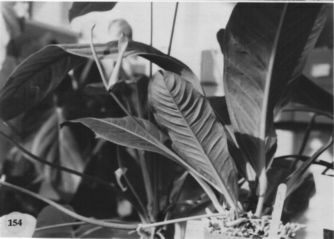 Anthurium ramonense can be distinguished by a combination of its proportionally shorter, stoutcr petioles, generally larger blades and long, tapered, generally stout inflorescence. Anthurium paludosum differs in having thick, nondilacerating, persisting cataphylls and proportionally narrower, usually smaller, con-colorous leaves with a conspicuous whitish-green midrib. Anthurium durandii differs in having proportionally longer petioles and in being geographically isolated in southwestern Costa Rica. Anthurium alatipedunculatum differs in having an alate peduncle and a 3-sided petiole. Anthurium ramonense is most easily confused with A. acutangulum because both share similar features including thin, dilacerating, promptly deciduous cataphylls and long inflorescences. 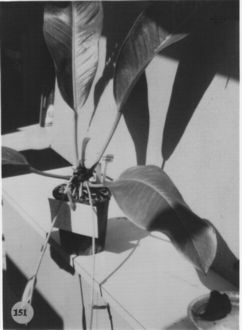 Anthurium acutangulum differs, however, in having smaller, typically elliptic blades and a proportionally longer, more slender petiole. The petiole ranges from equally as long as the blade to one third as long as the blade in A. acutangulum, whereas the petiole of A. ramonense ranges from one sixth to one third as long as the blade. The spadix of A. ramonense is also proportionally longer and stouter than that of A. acutangulum. Anthurium ramonense is a member of section Porphyrochitonium. Engler (1905) mentioned the affinity of A ramonense with A. filiforme Engler of Colombia. This is perhaps another species in the complex but it is inadequately known at present.